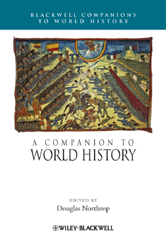 A Companion to World History presents essays from an international group of historians that both identify continuing areas of contention, disagreement, and divergence in world and global history, and point to directions for further debate. Features a diverse cast of contributors that include established world historians and emerging scholars. Explores a wide range of topics and themes, including and the practice of world history, key ideas of world historians, the teaching of world history and how it has drawn upon and challenged "traditional" teaching approaches, and global approaches to writing world history. Places an emphasis on non-Anglophone approaches to the topic. Considers issues of both scholarship and pedagogy on a transnational, interregional, and world/global scale. Part III Many Globes: Who Writes the World?